Everyone knows that cacti need little water. But in Guatemala’s most spectacular garden, the cacti are more watered than other plants. This is hardly the fault of the gardeners. They are not the ones doing the watering. 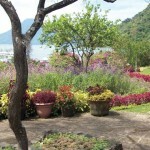 This botanical garden abuts another Central American superlative, Lake Atitlán. Their juxtaposition creates what is arguably the subcontinent’s aesthetic summit, a must-see for everyone. But there is one drawback to this union of turf and tide—just ask the cacti. 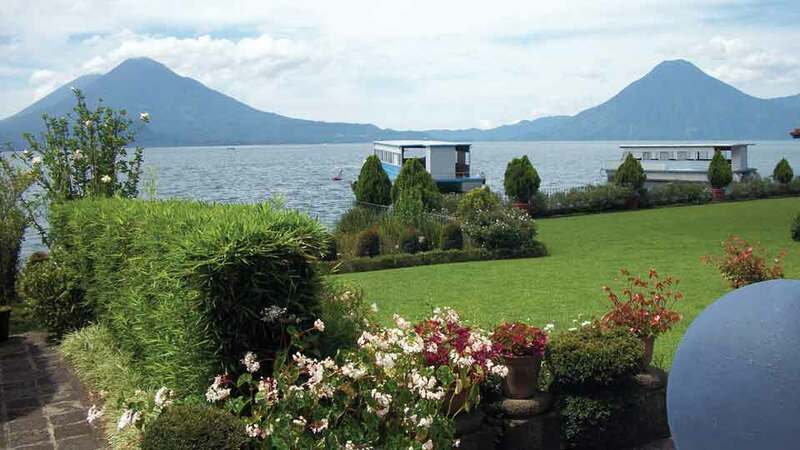 Lake Atitlán has a fluctuating level that rises and falls several meters over a span of decades. In 2004, it was at its lowest in memory; back then, there were slides and swingsets by the beach. And picnic tables and ivy-strewn pergolas. And a collection of water-shunning cacti and succulents. 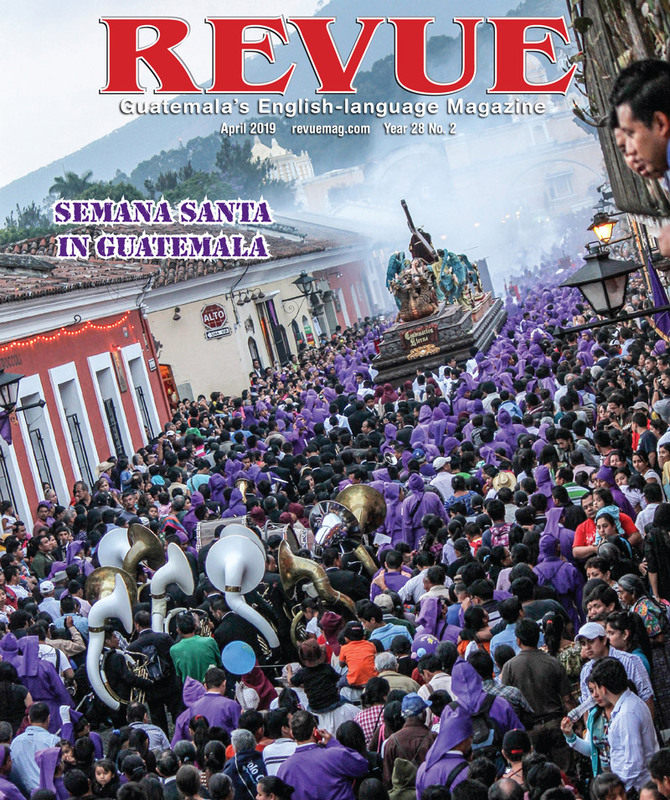 In 2005, Atitlán began an incessant rise that has recently slowed. Today, the only spot in the garden that lacks the sculpted, manicured look seen elsewhere is a platform near the shore crowded by potted cacti. Amidst a botanical paradise, there is a botanical refugee camp. 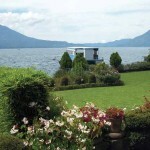 A few feet higher than the now-submerged cacti site sits the adjoining heliport of the Hotel Atitlán. Unless the lake stops rising soon, the choppers will need pontoons to land. The heliport is the gateway to Panajachel for heads of state and Hollywood notables, some of whom box their toupées in hopes of escaping autograph hounds while in town. Bill and Hillary Clinton alighted here in 1998 and had their own look at the garden. Or gardens. From the air or from satellite imaging, one can see that the botanical garden is evenly halved by the Hotel Atitlán and its parking lot. Altogether, the hotel and gardens form a huge wedge between neighboring hotel properties. From the ground it is not always clear where the hotel ends and the gardens begin. 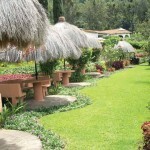 The hotel’s passages have rooms on one side and eclectic garden tracts on the other. The waiter delivering room service may not always get a tip, but he is consoled by flowers and twittering brooks on his return to the kitchen. There is a sense of permanence, almost eternity, to the place. You know it was not built in a day. 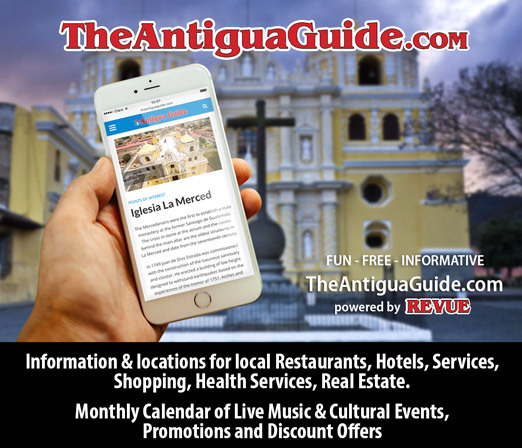 In the ‘60s, an expatriate woman married into the Rivera family, the titleholders of what had, years before, been the village of San Buenaventura. In fact, this annex of Panajachel, separated from the rest of town by a steep climb and a more relaxed descent, is still called this. Today, however, the villagers are the employees of five resorts and a butterfly preserve. Most of these are still owned by the Riveras. 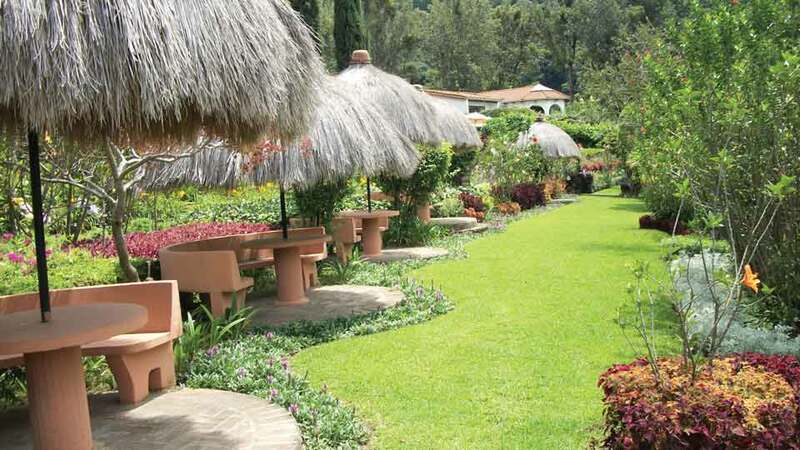 While Arturo Rivera was erecting the hotel in 1972, his green-thumbed bride had a vision, the one now actualized as a botanical facility rivaled by few others in the Americas. By 1980, all of the major elements were in place. Yet it remains a work in progress even to the present. The reclusive Mrs. Rivera was forever refining her realm. Even when in Panajachel, she was never available to strangers while she pruned or mulched for hours each day. For decades she was the ultimate garden hobbyist, but for seven full-time gardeners and one part-timer, the garden is their career. While the lake must be accommodated, weeds cannot. The men glean and comb the gardens daily, winnowing out tares and pests, and trimming dozens of topiaries. They still rotate among the garden’s divisions, to preserve morale and caretaker’s knowledge. Mrs. Rivera often admitted that she her self was no botanist. One spot in the upper garden is not dedicated to beauty, but to human palates. This is where organic fruit and vegetables are cultured for the hotel’s kitchens. Spinach, carrots, eggplants, stringbeans, pineapples and the like hail from here. There are strawberry and melon patches and an area for onions, garlic and leeks. Herbs and spices, however, grow practically wild among the ornamentals throughout the gardens; the cooks know where to find them. But all the plants, whether ornamental or edible, are fed with the same water that visitors to Pana see when they drive past the fabulous waterfall at kilometer 144. Lake water is used for nothing at the property—not even the hotel plumbing. There is no census on the variety of plant species, but they run to the thousands; every known terrestrial phylum is represented. Visitors who have come dozens of times always discover something new. In September, the gardens encroached anew on the hotel. Or maybe it was the other way around. The east wall of the restaurant’s panoramic restaurant is now a massive aviary, full of finches and lorikeets. It is sealed hermetically, if not acoustically, from the restaurant, such that diners hear and see the birds, but do not smell them. Aviaries are nothing new to the gardens. Large Victorian-style cages spangle the property, and you can get up close and personal with toucans and parrots. The scarlet macaws have their own mansion in an occulted, but accessible, corner of the property. But be warned: The territorial alpha male will start coming down the stair railings to nip anyone who stands and stares. A serene waterfowl pool features assorted swans, ducks and geese, and hummingbirds are everywhere, but bird lovers will track down the peafowl. A coy peahen has the run of the garden, and her mate is often seen displaying his finery. Sadly for him, he is better at impressing humans than he is at impressing his mistress. Peacocks are common in zoos, but you are unlikely in such places to see them shimmy their stuff as they do in minimal captivity. This unforgettable phenomenon might be compared to a meteor shower; the padded eyespots on their quills oscillate with metallic dynamism. You might expect all this magnificence to be too good to be free. But is it? Yes and no. Until 2004, anyone could walk in and stroll through the gardens at leisure. Panajachel’s expats used it for cheap dates and to wow out-of-town visitors. Weekenders from the cities visited to forget about home for a few hours. Wedding ceremonies for every budget had become popular by the 1980s. All these people still come, but not quite as freely. Some visitors, lamented Mrs. Rivera, made unwanted additions to the gardens. Mrs. Rivera therefore instituted admission. Today, visitors must pay Q55 at the parking entrance. But each visitor gets a voucher for this amount that may be redeemed in the hotel’s bar, restaurant or souvenir shop. Anyone with a voucher gets unlimited time in the gardens thrown in, along with a slick visitors’ map. 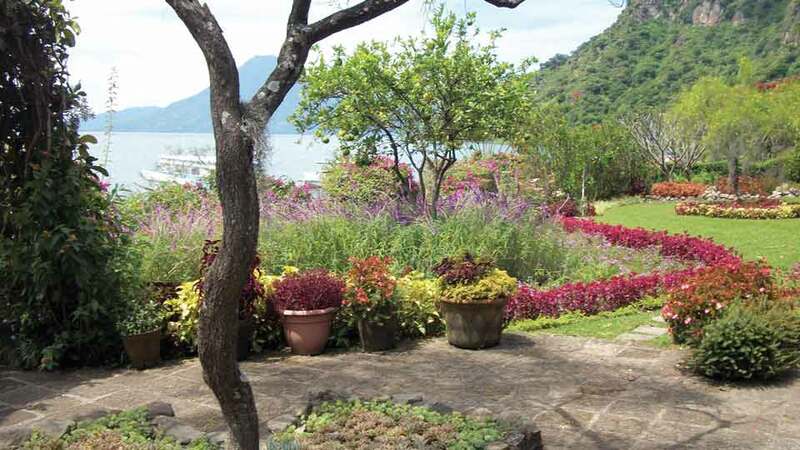 The Botanical Garden is a top asset for Panajachel, yet most tourists—drawn to the gilded frenzy of Calle Santander—are unaware of it. 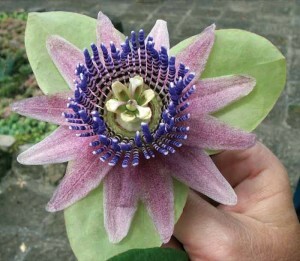 Yet it has all that any flower aficionado or bird lover could want. And, if you act now, maybe even a garage sale on cacti.